The field of dreams had lived up to its billing for James Fitzpatrick. 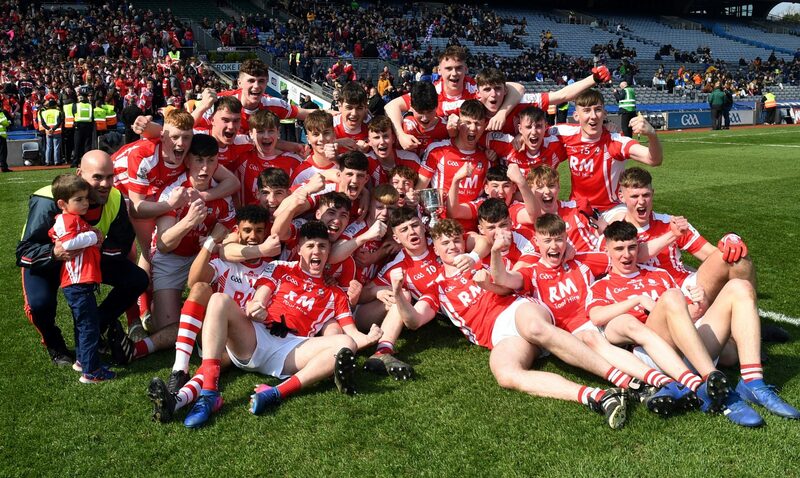 Celebrating with team-mates, family and friends in the Hogan Stand, the Oran match-winner was finding it hard to comprehend that his last-gasp point had catapulted Roscommon CBS into the stratosphere reserved for champions. “I still can’t believe it has happened. It doesn’t feel right. We didn’t want anything else in the world more than this today. “I had seen the clock a few seconds beforehand. There were three lads around me. To be honest, I didn’t know what I was going to do but the space just opened up, and I had to take a shot,” he said, reliving those final moments of Saturday’s tension-filled melodrama. CBS struggled for the opening 30 minutes but the team’s belief never wavered in the face of adversity. We were just brutally honest (at half time) — if we play the same way, we won’t be winning it. But we knew that we were able to win the game. We knew we were better than them. For manager Eoghan Coll, the expression on his face suggested a torturous experience. He knew that deliverance was possible for this group of players. But having overcome so many different obstacles to finally get over the line, all the pain had yielded the ultimate gain. “It’s just elation and relief. It really was an emotional rollercoaster. We showed nervousness in the first half. The boys were edgy on the ball. We carried it into tackles. We did what we usually don’t do — play at a slower pace. “Defensively, I thought we were okay. We never gave them easy chances. But with the ball, we weren’t ourselves. At half time, it was about telling the lads to go out and play — remember when you’re kicking the ball, the ball is your friend. When you’re in possession, do what you think is right. Obviously we had to stick to the gameplan but we just had to be a bit more assertive, a bit more aggressive. “We pushed up on their kickouts, which helped us for that first ten minutes. Then there was the injury to Jack Lohan when they had started to come back a little bit. They showed great determination. We could have avoided a little bit of that in terms of the frees we gave away. “I suppose it was the nervousness of knowing that we were a few points ahead. In fairness to their full-forward, he nailed all of them and we missed a few ourselves. Extra time looked likely but we scrambled that last kickout and we got the ball to the right man in the right place. “So to win when a lot of things went wrong is nice. It could easily have fizzled out. They had all the momentum but it was great to be able to fight back,” he explained. In the end, it was James Fitzpatrick’s winning point that made the headlines, showcasing to a future generation of CBS players that anything is possible. “James was one of a couple of players we’d want in that position at that time. The way he feigned to the left and stepped right, he has magic feet. He has missed a lot of football this year through injury. It’s great that he got his chance in Croke Park to kick the winning point. Not too many Roscommon players have got that chance. “On a day like this, you feel as if you’ve made the right decision. Maybe we could have won a Connacht A title but we’re not going to think about that at the moment. It’s just great to be at elite level football, playing in Croke Park. “I was looking up at the crowd at the end, seeing some of the First Years, and they’re thinking ‘this could be me’. It’s a realistic aspiration for them, and that’s what we want. You can play football at a high level in CBS, have fun, and they believe that they can be the next team to do that,” he concluded.